When did Procol's second line-up cease trading? Date of last gig of the Procol line-up from the first three albums? WHEN DID PROCOL HARUM No. 2 SPLIT UP? Pete Frame is generally considered as one of the best-informed music journalists on the planet. His Rock Family Trees are highly regarded. 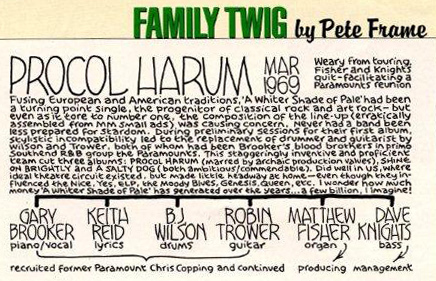 Of course he made one of Procol Harum: it can be found in one of his Rock Family Tree books, but was also enclosed in the PH compilation Portfolio (1988). 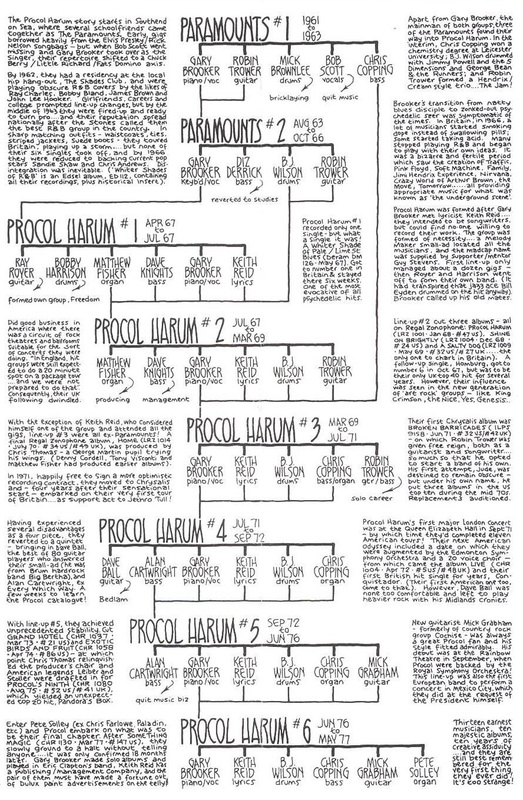 According to Frame, Procol Harum No. 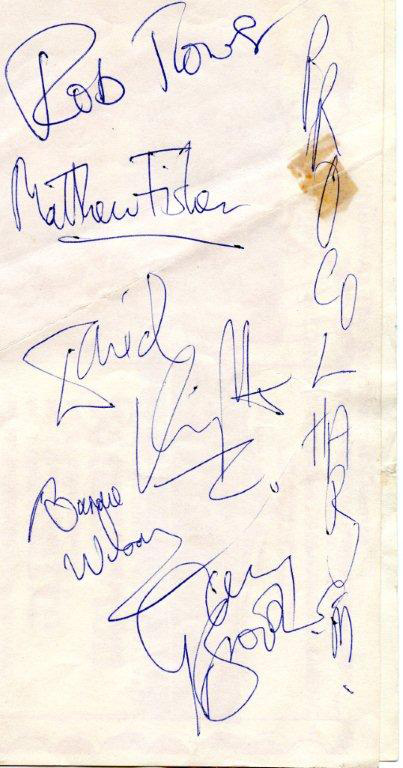 2 (Brooker, Fisher, Knights, Reid, Trower and Wilson) existed from July 1967 until March 1969. He calls them a staggeringly inventive and proficient team. This same source tells that Procol Harum No. 3 (Brooker, Copping, Reid, Trower and Wilson) existed from March 1969 until July 1971. The question arises: who’s right? Pete Frame (‘March 1969’) or Rolling Stone (‘December 1969’)? After this tour the band returned to England. On 18 May Procol was part of a free concert at London’s Parliament Hill Fields, together with Soft Machine, Third Ear Band, Blossom Toes and Yes. The rain was pouring down (see here), so the critics stayed away. Procol played some more gigs in Britain to promote A Salty Dog. In June 1969 Procol started their sixth US (& Canada) tour (June–August). Highlights were The Toronto Rock Festival (22 June), Fillmore East again (27 & 28 June), Saugatuck Pop Festival (4 July), the Shakespeare Festival in Stratford Ontario (6 July, their first concert with an orchestra), Atlantic City Pop Festival (1 August) and The Singer Bowl Music Festival in New York (2 August). August 2 was thirteen days before Woodstock, to which Procol had declined the invitation because Robin Trower’s wife (the late Andrea) was due to give birth to her first child. 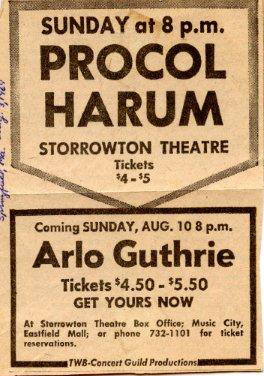 So, generally, 2 August 1969 is considered the last gig of the Procol Harum Mk. 2 line-up. 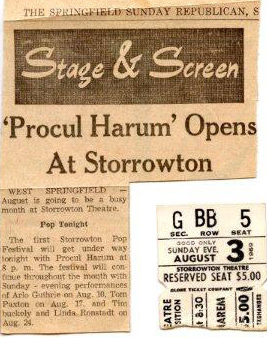 But … Storrowtown, a small town in West Springfield (MA), had organised the first Storrowtown Pop Festival in August 1969, and had contracted Procol Harum to play there on 3 August. And, for the first time, ‘Beyond the Pale’ can offer conclusive proof that Gary, Robin, Matthew, David and BJ did indeed play there. 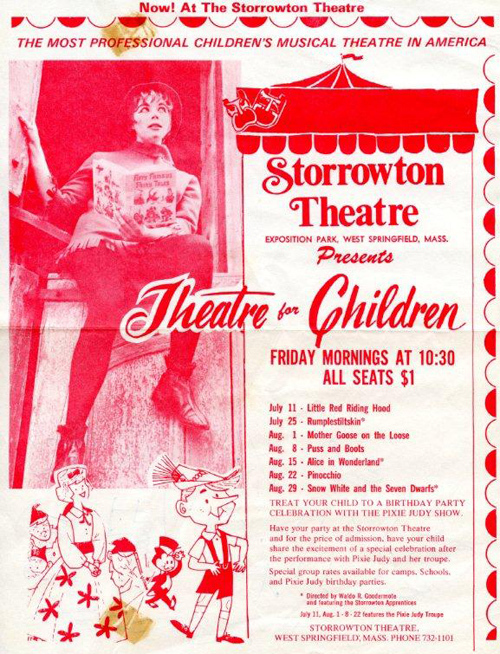 The announcement in The Springfield Sunday Republican says a lot, but the ticket stub and the five signatures on the back of a Storrowtown Theatre leaflet are conclusive evidence of their participation. So … no more doubt whatsoever about when Procol Harum No. 2 played their last gig: it was 3 August 1969.